Lawson and I really like to entertain, so since we moved into our house in May, Lawson and I have been looking forward to having a housewarming party and breaking in our new house. Since the weekend of July 14th was the best time for us, we decided to have a Bastille day themed party - which turned out to be a great excuse to come up with a french-themed menu. I may have gone a little overboard... we had a cheese plate and a veggie tray, and I cooked a number of favorite items such as french lentil salad and meringues. I made Smitten Kitchen's Zucchini and Ricotta Galette, which I had made once before and was just as yummy this time as the first time (although I didn't get a picture, so you'll have to take my word that it really does turn out as great as she says). I also made a lemon curd fruit tart that I had made before but which I hadn't made in years, and which was a great way to use fresh berries from the farmer's market, and I made a broccoli quiche which I had made before (although I wasn't as thrilled with how it turned out). 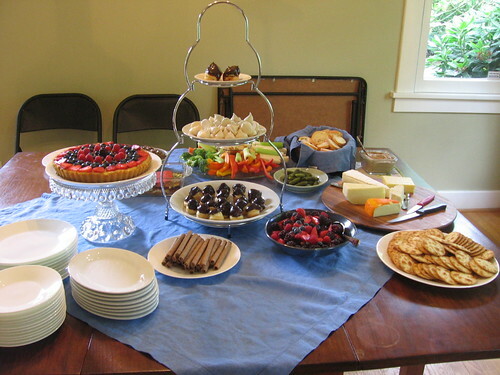 I tried out a few new recipes - a mushroom walnut pate, and creampuffs (mini-eclairs) which were a big hit, especially with the kids at the party. I'll be back to share recipes soon! The party went really well and all the food was all a hit, although we were pretty wiped out afterwards. We are looking forward to entertaining more in our house now that we are getting to be mostly settled in! I feel like every blog post I have written lately starts with an apology about how long it has been since I last blogged, so I won't do that, other than to say I certainly didn't intend for it to be this long and hope to get back into a more consistent blogging habit soon! In good news, we are all moved into our new house and getting closer to mostly unpacked. We are really enjoying the new house and I am hoping to have much more time for sewing and other fun pursuits soon! 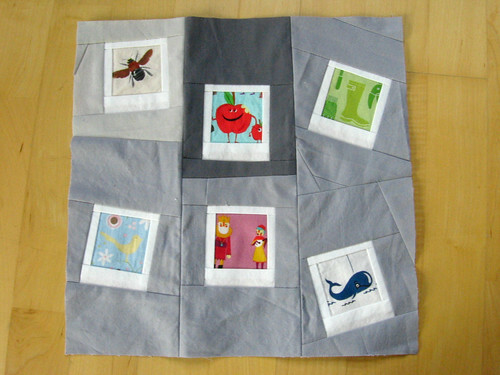 So, here are my last three months of bee blocks that I made for the Love circle of the do.good stitches bee. Above are this past month's improv block for Jacey - I hadn't done much improv piecing before, and I really enjoyed making them! I'll definitely have to do some more improv projects soon. 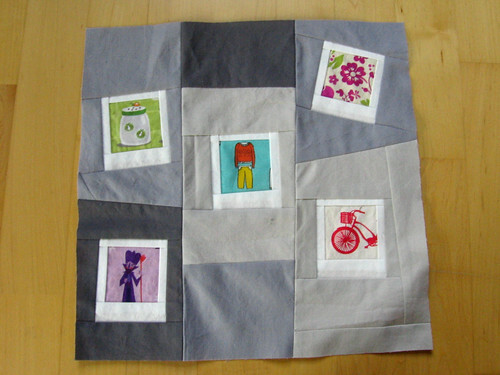 For May, Deb asked us to make Patchwork Wheel blocks from (tutorial by Elizabeth of Don't call me Betsy). 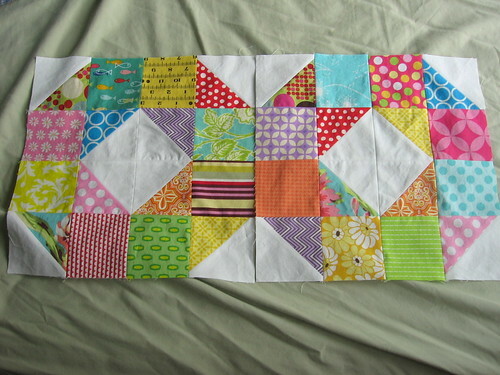 I had fun making these scrappy bright blocks and enjoyed the secondary pattern of a star that emerges when you put them together. For April, Rachel asked us to make Polaroid blocks loosely following this tutorial - but said it was fine if they had fewer than 9 polaroids in each block. I liked the looser arrangement with fewer "photos" so I paper pieced each of the polaroids and then basically built each part up and fit it all together. 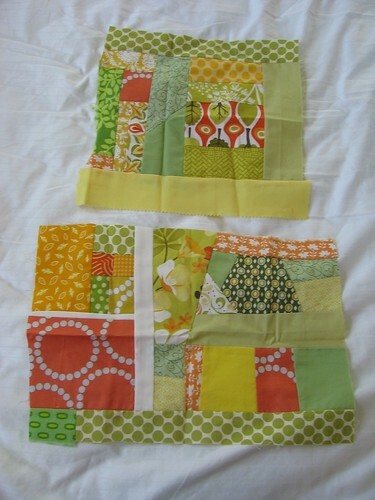 It was really fun to get to fussy-cut some of my cute fabrics and showcase them with these blocks!